Matt Tegenkamp played many sports while growing up - baseball, basketball and indoor/outdoor soccer. As different as those sports are, they each involve running. At soccer practice the coach would have them warm-up around the fields. Matt loved it. Running came naturally to him and he enjoyed it. He always challenged himself to do it faster than the previous time. So when the opportunity came to run outdoor track in 7th grade, he took it. He liked it so much he decided to run cross country in the fall. Competing for Lee’s Summit High School in Lee’s Summit, Missouri Matt excelled. By the time he finished 9th grade he had posted personal bests of 4:52 (1600) and 10:04 (3200). His junior year he won the Missouri State title in the 3200 meter run. That fall, at the state meet, he not only won the cross country title, he set the course record. He went on to finish 5th at the Footlocker Cross Country Championships the following month. Things only got better. In the spring he posted a blazing 8:53 for 3200 meters and was a double winner at the state meet winning both the 1600 and 3200 with times of 4:11.43 and 8:57.23. It’s not hard to imagine that Matt was highly recruited. Arkansas, Colorado, Stanford, Wisconsin and Oregon were all on the list. In the end, it all boiled down to two things - Wisconsin’s coach Jerry Schumacher’s training philosophy and Matt’s desire to stay true to the Midwest. As a Badger, Matt won the USA Junior Cross Country Championships then went on to place fifth at Worlds. He was part of cross country teams that were national contenders. Those teams placed 5th his frosh season and second his sophomore, junior and senior years at NCAA’s. His best finish was 8th place his red-shirt freshman year. By the end of his collegiate career Matt was a 10-time All American and won a Big Ten title in cross country and the 1500 meter run. He graduated in 2005 with a Bachelor of Science Degree in Human Ecology. After graduation Matt decided to stay in Wisconsin and continue to be coached by Jerry Schumacher. In 2006 he had what he called a “learning year” during the European track season. He learned to race in a way he never had. That year he became the 8th fastest U.S. performer all-time in the 3000 at a meeting in Monaco running 7:34.98. In 2007, at the Prefontaine Classic, Matt ran 8:07.07 to set a still standing American record for 2-miles. Later that summer he finished 4th at the World Championships in the 5000. In 2008, at the Olympic Trials, he was in a thrilling battle in the 5000 where there were five men with 400 meters to go each vying for a spot to make the Olympic team. Matt finished second and punched his ticket to the Beijing Olympics. 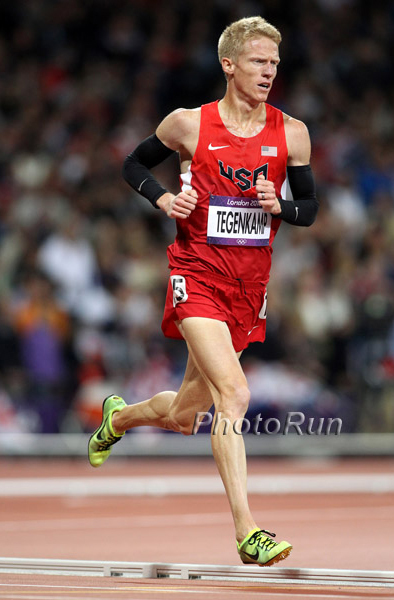 In 2009, he had another great year - he won the 5000 at the U.S. Championships then, at a meeting in Brussels, he broke the 13-minute barrier in the 5000 running 12:58.56. Today, that time is the 4th fastest time ever run by an American born athlete. In 2011, he moved up to the 10,000 and became the 10th fastest U.S. performer ever running 27:28.22. In 2012, Matt finished second at the Olympic Trials in the 10,000 meters qualifying him for his second Olympic team. Last year, he won the U.S. 10K Road Championship at the Peachtree Road Race in Atlanta and ran a 2:12:39 debut marathon in Chicago. Matt says he owes his success to the incredible support system he’s always had. It includes his parents, high school coach, college coach, teammates and his wife, Michelle, who is also a very accomplished runner. She was an All-American at Wisconsin and a member of multiple Canadian national teams. Matt resides in Portland, Oregon with his wife, Michelle, and two son’s Brayden (4) and Nolan (2).